If you’ve seen my tweets lately, you already know that my man and I are currently watching the Little House on the Prairie TV show from the 1970s-80s. I keep railing about how they need to get some durn cell phones and a hospital and some non-neck-breaking roads, and no I don’t care that I’m being technologically anachronistic. 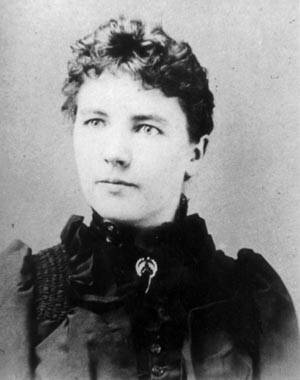 The funny thing is, when I picked up my first book by Laura Ingalls Wilder (I was 9 or 10), my mom remarked that I used to watch the TV show with her when I was a baby. I gave her a pretty hard time when I was born, so she needed to recover, and she’d turn on LHOTP in the afternoons. She’d cuddle me and we’d watch barns burning down, people getting thrown off horses, typhus spreading around town, and other lovely things that happened on the frontier. But of course, there were also good things, like prairies you could roam around, snug log cabins with fireplaces, clear streams you could drink from, and other simple pleasures. NO WONDER I’m obsessed with the 19th century American frontier and the pioneers who crossed it in their covered wagons. No wonder I read the first Little House book and then proceeded to read every other one Wilder wrote, as well as those she didn’t but that told the story of her daughter Rose and her married life. I read a biography of Wilder a couple of years ago, and when my husband and I went on a trip around Wisconsin, I insisted that we stop in Pepin, where Wilder was born, so I could see the museum and replica of her childhood home. 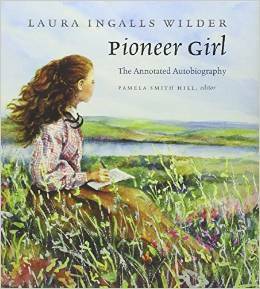 You can imagine, then, the heart palpitations when I heard about the release of Pioneer Girl: The Annotated Autobiography late last year. It was a wonderful feeling “hearing” Wilder’s narrative voice again, but this time unfiltered and not as heavily edited. The annotations offered fascinating information about characters only briefly mentioned in her books, and the photographs of her various homes, friends, and neighbors, well…needless to say, I passed the book along to my mom, who will one day, one fine day, return it to me, she promises, cross her heart. It’s been too many years since I read Wilder’s books about her childhood and young-adulthood during a time of great change in the U.S. The Civil War had ended, but divisions and bitterness remained; railroads were springing up all over the place; inventions and discoveries were fundamentally changing how people lived and worked. Meanwhile, Wilder moved around the mid-section of the country with her family, helping with chores, watching her little sisters, going to school, and braving the elements. Her books sucked me in and made me believe that I was living through the “Long Winter” or playing by the banks of Plum Creek. And like everyone who complains that movies aren’t as good as the books they’re based on, I find myself watching LHOTP and feeling torn between enjoying it as a show and getting frustrated because much of it is not based on events in Wilder’s books (at least as I remember it). In the show, Laura is always getting into trouble, which I don’t remember happening in the books. And I barely remember reading about Nellie Olson, but she plays (too big of) a part in the show. I understand that the show is loosely based on the books, and I appreciate it’s overall historical accuracy (though my nerdiness has alerted me to a few anachronisms but whatever). I plan to read all of Wilder’s books to my kids when they’re old enough to sit through a book for more than 5 minutes. We’re going to go back to Pepin, and we’re going to participate in the Laura Ingalls Wilder Days events. My kids are going to learn all about Wilder and her life and they’re gonna like it. Until then, we’re going to finish watching LHOTP and I’m going to keep pestering my mom about sending the book back. Oh, and love you, Laura!